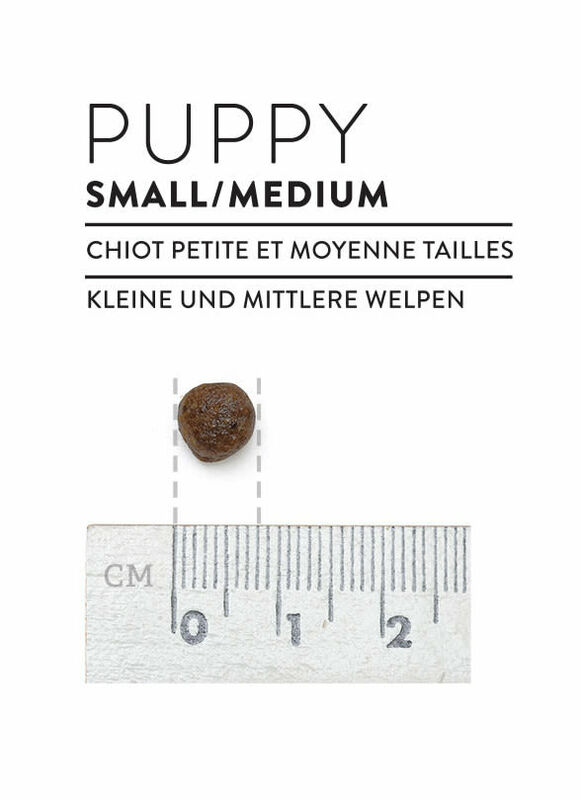 Canine Choice Puppy Small & Medium is a complete grain-free dry food for puppies of small and medium-sized breeds (adult weight below 25 kg). It has a high proportion of meat (60%). Puppies of small and medium breeds burn more calories than larger puppies. That’s why our recipe is nutrient-dense and has plenty of protein. Canine Choice Puppy Small & Medium can be fed from 6 weeks of age through to 12 months. Fresh Chicken (32%), Dehydrated chicken (23%), Sweet potato (14%), Chicken fat, Peas (7%), Hydrolyzed chicken liver (5%), Apple pulp (4.3%), Dehydrated Carrot (0.33% equivalent to 3% carrots), Dehydrated cranberries (0.08% equivalent to 7,5% cranberries), Pea protein, Brewer’s yeast, Fish oil, Minerals, Chicory (source of FOS), Mannan-oligosaccharides (MOS), Camomile, Parsley, Rosehips, Sea algae, Rosemary, Cloves, Glucosamine (300 mg/kg), Cartilage (a source of Chondroitin 200 mg/kg), Yucca schidigera. Crude protein 32%, Crude oils and fats 21%, Crude ash 7.5%, Crude fibres 3.25%, Fatty acids (Omega 3) 4.0%, Calcium 1.4%, Phosphorus 1.05%, Fatty acids (Omega 3) 0.4%,Metabolizable energy 4050 kcal/kg. Vitamin A 20.000 IU/kg, Vitamin D3 1.850 IU/kg, Vitamin E 600 mg/kg, Vitamin C 300 mg/kg, Zinc (Zinc oxide) 108 mg/kg, Iron (Ferrous sulphate, monohydrate) 68 mg/kg, Carnitine 60 mg/kg, Copper (Cupric sulphate, pentahydrate) 9 mg/kg, Manganese (Manganous sulphate, monohydrate) 7 mg/kg, Iodine (Potassium iodide) 3.2 mg/kg, Selenium (sodium selenite) 0,11 mg/kg. When we got our puppy he was on a food I didn’t like so we tried a brand that sounded good but it didn’t agree so we decided to try canine choice as my mums dogs had been on it! Best choice we made! Puppy loves it & it’s great on he’s tummy! 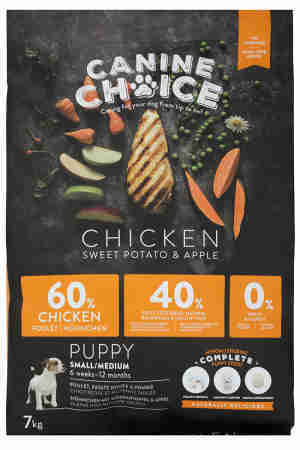 Our puppy has a very sensitive tummy and this is the only food that seems to agree with her it's a definite paws up and very reasonably priced.